Oh, I just love this series. 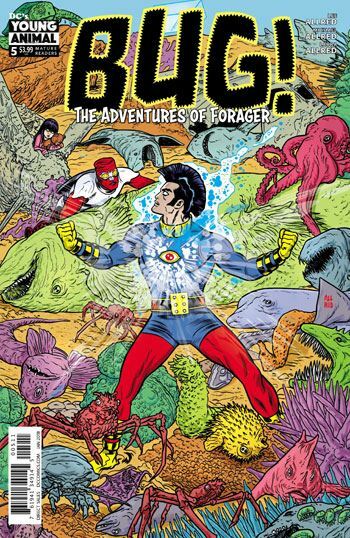 In the latest issue of Bug: The Adventures of Forager the Allreds look way back to the final issue of OMAC, which was cancelled mid-storyline. Even though a later OMAC back-up series, which ran in Kamandi and Warlord, continued the story, it did so by ignoring the cliffhanger from the last issue, more or less. 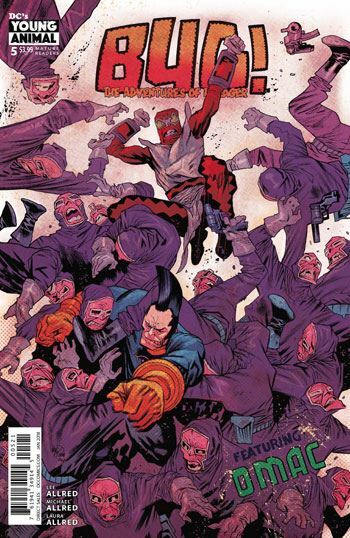 Well, the Allreds will have none of that, and so neither with Forager. This issue takes us right back to Dr Skuba’s plan to turn all the water in the oceans into little blocks, his defeat of Brother Eye, OMAC being turned back into Buddy Blank, and the other plans of the two “children” he had as minions. True, perhaps this is casting a line a bit too far back. I have read other reviews of this series that view the immersion in old DC stories in a negative light. But I, for one, do not see it that way. The DC Universe can be a wonderful playground, and Bug has proven itself to be a great thrill ride to explore that world. Yes, it is true that one will appreciate this comic far more if one had read Kirby’s OMAC series. So why not just do that? It’s not like reading classic Kirby is a punishment or anything. This is another perfect issue, as fulfilling as it is possible to be. And as a sucker for the use of board game layouts in comics, the final page had me squealing in delight.